Netflix (NFLX) is hoping its latest move doesn't turn out to resemble a British comedy. The video buffet operator introduced its streaming service in Ireland and the U.K. on Monday, hoping that TV buffs across the Pond take to the new digital video service. Overseas expansion should be old hat for the flinger of flicks. It rolled out a similar DVD-free service in Canada in 2010, and followed that up by breaking into 43 different countries throughout Latin America and the Caribbean late last year. It's not business as usual at Netflix, though. There will be challenges breaking into markets No. 46 and 47. Its hardest geographic expansion is the one it can't afford to mess up. And the fallen tech darling is vulnerable after its own comedy of errors in 2011. Investors cheered Netflix's push into Canada. They were pumped about last year's southward expansion. But don't be surprised if the logical step into Europe isn't greeted with the same kind of enthusiasm. There are several factors weighing on the company right now. 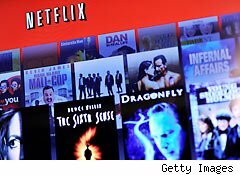 The historically profitable Netflix warned that it would post a loss early in 2012 as a result of breaking in its streaming service in the U.K. and Ireland. It had no problem turning a profit during its previous expansions. Now that guidance for a loss has spread to the entire fiscal year, though Netflix's domestic woes are probably a factor. Netflix lost 800,000 net subscribers during 2011's third quarter. In other words, momentum isn't on its side. Unlike other territories where Netflix stepped in as the undisputed leader of unlimited video streaming, Netflix is entering Europe as an underdog. Amazon.com's (AMZN) LOVEFiLM has been entrenched in the region for years. Offering a combination of discs by mail and a limited streaming catalog, LOVEFiLM is a close match to the Netflix service that folks on dual plans enjoy in the United States. LOVEFiLM has spent the past few months locking up streaming rights -- in some cases exclusively -- in advance of Netflix's arrival. This week, it's ready for war. Just as Netflix went public with its service price of 5.99 pounds a month in the U.K., LOVEFiLM introduced a streaming-only service at 4.99 pounds a month. A pioneer and market leader undercutting a new competitor is one way to squash a potential rival, but we can't write off Netflix just yet. The first wave of users checking in on Netflix's blog have been generally pleased with the new offering. "More and better content than Lovefilm and much, much better quality," writes one early adopter. "Looks HD on my AppleTV and on my Mac." "The selection looks great so far," writes another tire kicker. There are also a few readers lobbying on the blog for streaming expansion to the Netherlands. Before we dismiss these early comments as Netflix shills, keep in mind that this is the same Netflix blog that blew up with venom during last year's rate hike announcement in July and the short-lived but incendiary Qwikster news three months later. The first of these comments is from someone actually complaining about the lack of online queuing, so there's some balance to the lovefest. Every new territory requires different content licensing deals with an emphasis placed on local favorites. Netflix's launch in the U.K. and Ireland features local and stateside television shows including The Only Way Is Essex, Prison Break, and Damages. Movies include 3:10 to Yuma, Blitz, and The English Patient. It's not easy to keep a streaming service fresh and exciting. Netflix served up an average of roughly 30 hours a month of streams to its digital subscribers during the fourth quarter, far more than what was consumed on its monthly DVD plans. The moment that folks run out of streaming content that they want to watch, they're done. Netflix can't afford to come up short. Expanding into continental Europe and Asia will be obvious next steps, though Netflix has yet to announce international growth plans. It will want to make sure that it can both compete in a region with an entrenched provider and turn its finances around before jumping into even more new markets. The lull between now and when new international markets go online will place even more pressure on this week's overseas push. If it can't compete successfully with LOVEFiLM -- and if it can't resume overall subscriber growth in 2012 -- other countries won't view Netflix the same way that Canada did when a million net users signed up for the streaming service in its first year. Netflix may not seem as cool in the United States as it seemed a year ago, but the company is hoping that we can keep that our little secret. The world wants streaming, and Netflix wants to be the one serving up the digital content. Longtime Motley Fool contributor Rick Munarriz does not own shares in any stocks in this article, except for Netflix. The Motley Fool owns shares of Amazon.com. Motley Fool newsletter services have recommended buying shares of Netflix and Amazon.com.